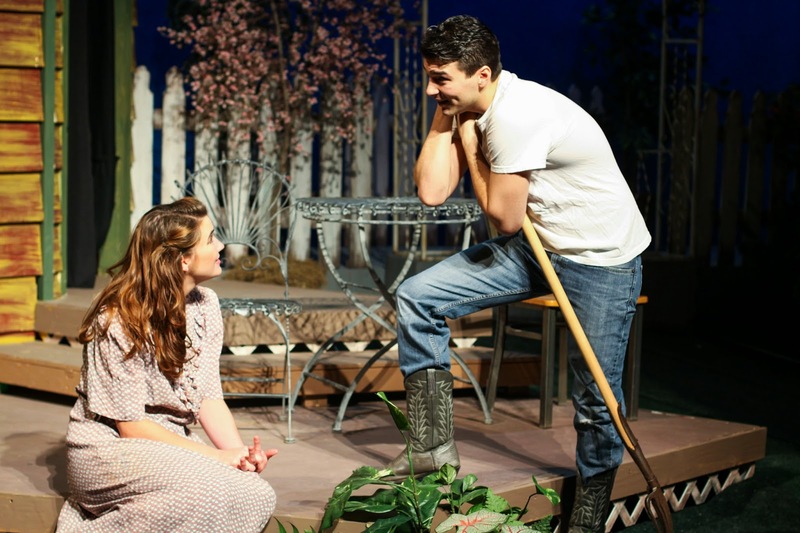 The 1953 play Picnic* by William Inge is an American classic, straight out of the pages of Americana. Crisply drawn familiar characters, a small-town rural setting in which everyone knows everyone's business, strictly defined life paths to follow that the characters struggle against as they long for something more in life. Inge is a bit like a Midwestern Tennessee Williams (which is a good thing in my book). And as I've come to expect from Lyric Arts, the "big city theater with hometown charm," they do a really nice job presenting this classic. The ensemble piece is very well-cast, with each actor bringing their best to these deceptively complex characters. And the lovely green and floral set makes you forget for a moment the crisp white coldness outside. Picnic takes place over about 24 hours or so in the hot late summer of rural Kansas, where the most exciting that happens is a picnic with returning teachers and students. As it turns out, this simple picnic and the events surrounding it set off a series of decisions in several characters' lives, changing them forever. The action takes place in the shared yard of Mrs. Potts and Mrs. Owens. The latter is the mother of two teenage daughters - older sister Madge, "the pretty one," and younger sister Millie, "the smart one." Madge has a wealthy college-educated boyfriend Alan, whom her mother hopes will marry her. But both girls have bigger dreams for their future. Dreamy Madge is dissatisfied with only being "pretty," and wonders what else there is for her, and tomboy Millie wants to read and learn and move to New York. Their father's absence is never explained, but it's hinted that he left them in some way. Mrs. Owens has taken in boarders, including "old maid schoolteacher" Rosemary. The appearance of a young man, who turns out to be a fraternity pal of Alan's, begins to stir things up. They all plan to go to the picnic together, but whisky, dancing, and frank conversations change those plans. Morning dawns, with a heartbreaking and beautiful conclusion full of raw emotion, as Madge cries out in anguish, "What do you do with this love that you feel? Where is there that you can take it?" Standouts in the cast include Kate Beahen, whose beautifully layered performance shows us that Rosemary is not as happy being an "old maid schoolteacher" as she pretends; Anthony R. Johnson as her reluctant boyfriend Howard (overheard in the audience, "he's perfect for this role"); Randy Niles, who plays Alan as clean cut and charming in a Pete Campbell surface kind of way; Nykeigh Larson, a spitfire as Millie; and Sarah Frazier and Jarome Smith as the charismatic young lovers. The charming set (by Brian J. Proball) features a sloping green turf lawn, many plants and flowers, a white picket fence, and the facades of two farmhouses. The lighting (by Matt McNabb) reflects the changing daylight, from the hot sun of daytime, to the warm glow of sunset reflecting off the actors' faces, to the dim and cool moonlight. And I loved the period costumes (by Samantha Fromm Haddow) with matching hats, purses, shoes, and gloves! Picnic continues at Lyric Arts in Anoka through January 26. Check it out for a well-done community theater** production of an American classic. *Fun fact: the original Broadway production of Picnic featured the debut of a young actor named Paul Newman as Alan. **I do view theater differently at a community theater vs. a professional theater, because they simply are not working with the same resources. But I often admire artists who work in community theater more because most of them do not get paid; they do it "for the love." And it's often just as enjoyable and engaging, which is what it's all about. 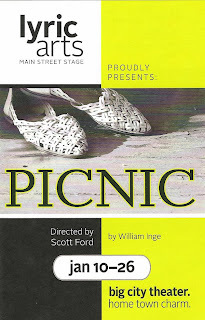 Picnic at Lyric Arts was absolutely great. I certainly agree with your appraisal of Kate Beahen; she is one to watch!